The city of Dubai is the biggest city of the United Arab Emirates and the administrative center of the Emirate of Dubai. It is a major commercial, financial and tourist center of the Middle East that has experienced rapid growth after 1960, due to the exploitation of oil in the region. Dubai is a city of contrasts and of overkill with the cosmopolitan lifestyle and a lot of attractions.The luxurious hotels, vast shopping malls, traditional Arab markets (souks),the sunny beaches and the vast desert offer an unsurpassed variety to every visitor and make this unique destination. Burj Khalifa, the highest building in the world, rises to 160 floors and you can enjoy the view from the top of during your visit. Dubai Mall is a major shopping center that includes a spectacular aquarium with underwater Zoo and regular-sized rink. At the entrance you can admire the largest fountain in the world that is and ideal backdrop for photos. 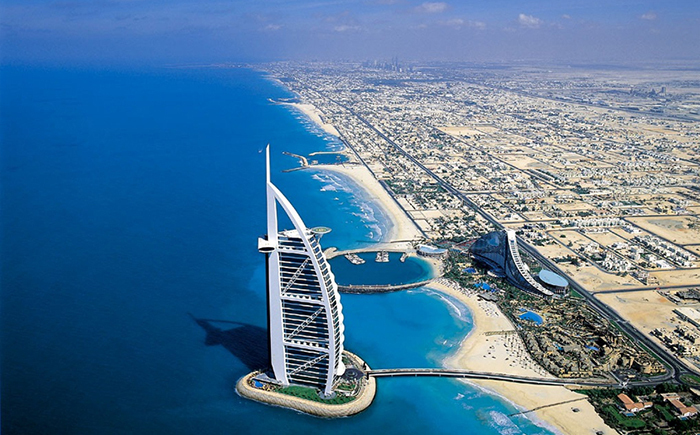 Burj al-Arab: In the most luxurious hotel in the world and landmark of Dubai, is definitely worth a visit. Located on an artificial island 280 metres distance from the coast and is shaped like a ship's mast, with walls of solid gold. It is considered the only 7-star hotel in the world. Palm Jumeirah is a cluster of artificial islands in the shape of a Palm tree that include hotel complexes, restaurants, shops and a host of other tourist facilities. The virtual Hotel Atlantis, The Palm, inspired by the legend of Atlantis, with the theme park Aquaventura and Dolphin Bay where you have the opportunity to swim with dolphins. Dubai Museum, housed in an imposing building of 1797, is a military museum with exhibits from the most important historical moments of Dubai. It depicts scenes of everyday life in Dubai days before the holding of oil with sound and Visual effects, as well as replicas of normal dimensions. Some of the representations you can see include traditional Arab houses, mosques, the market (souk), life in the desert and Pearl fishing. Gold and Diamond Museum: The Museum contains some of the finest jewelry and precious thinks in the world while revives the rich tradition of the Dubai Pearl fisheries. The Dubai travel network is second to nothing compared with Western standards and provides reliable options for locals and tourists. Specifically, you can use the bus or metro, the ultra-modern to drive themselves or get a taxi at very reasonable prices. 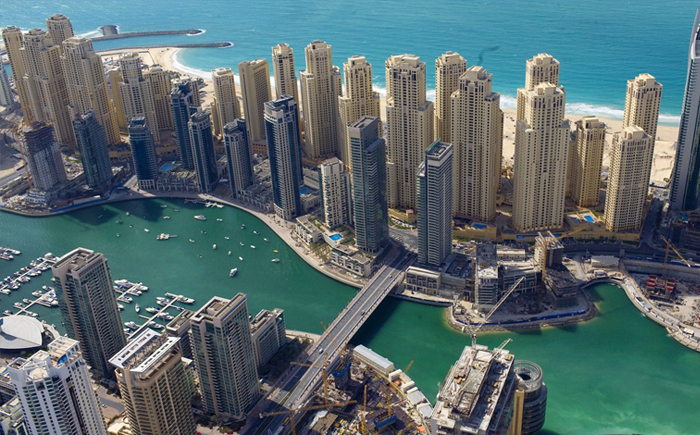 Dubai offers a wide range of options for every type of visitor. you can stay in one of the luxury hotels near the coast or to choose accommodation in the center of the city, where they found many more budget hotels. Explore traditional Dubai with the Jymeirah Mosque, the historical Bastakiya district and Museum-fortress Al-Fayida, wander in the desert with camels or with a unique balloon ride and take a cruise on the Creek. Of course, don't forget a dash on Dubai's beaches but also a walk to department stores and shopping malls. For your night entertainment, Dubai would certainly not disappoint you, with the majority of hotels have bars and night club, offering you countless options. the element of luxury dominates and nightlife of Dubai with score to encounter some of the most impressive nightclubs here. In Dubai you can find a large number of restaurants to enjoy traditional flavors and to discover the international cuisine. A special experience is a dinner cruise with during wooden boat (dhow) into the Creek. Dubai is one of the most famous destinations for lovers of shopping and boasts up to well-established annual Shopping Festival, the Dubai Shopping Festival, which takes place every spring and attracts thousands of tourists because of the low price. Department stores and shopping malls in Dubai are plentiful and remain open from 9 in the morning until 11 at night. in addition, undoubtedly deserves a ride in the gold market, Gold Souk, and spice to the traditional market of Dubai.Finally, when leaving, don't forget to take a ride to the airport's duty free stores.